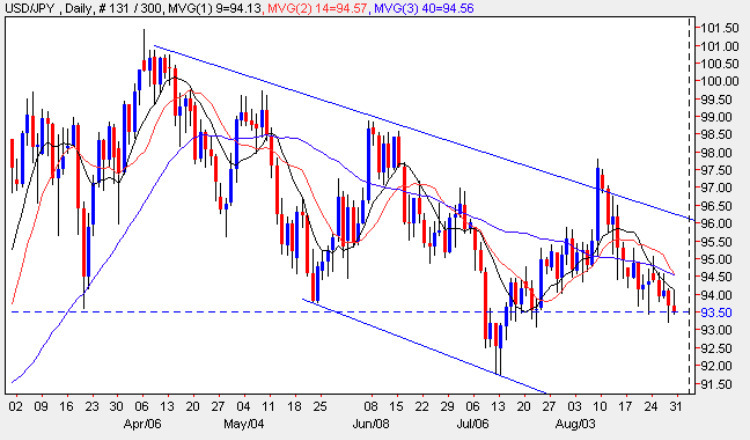 The yen to dollar pair continued their stately progress lower last week, as they continue to slide lower in a series of lower highs and lower lows as shown on today’s forex chart for the currency pair, with Friday’s candle reinforcing this bearish tone once again with a weak candle and a deep upper shadow. To confirm this picture the high of the day met resistance from the 9 day moving average, failing to clear this technical indicator before falling back to close the week and the session lower, having broken below through the floor of the support level at 0.94 once again. With all three moving averages now weighing heavily once again, we should see this pattern continue in trading next week and as a result begin to look for the 89,00 price level which would seem to be suggested from a forex analysis of the daily chart. The Far East trading session for fundamental news kicks off early on Monday with the release of several key pieces of news for the Japanese Yen, starting with Manufacturing PMI, Preliminary Industrial Production, and Retail Sales, which are followed up later with Housing Starts and a speech from Bank of Japan Governor Shirakawa. Of these releases, the Industrial Production and Retail sales figures are the most significant, with the first forecast at 1.4% against a previous of 2.3%, and the latter at -3.3% against a previous of -2.9%. If both these forecasts are correct then this will be bad news for the Japanese economy which had been looking slightly more healthy in recent weeks with several key indicators suggesting that the bottom had been reached and the economy was beginning to recover ( albeit slowly). Housing starts are of lesser importance but once again if the forecast is correct at -30.3% against a previous of -32.4%, then once again this is not good news although given that we are in the depths of summer the numbers may not surprise the forex markets too much. In addition it will be interesting to see the extent to which the election of the DPJ affects the Yen in the short to medium term.